Fifteen years ago, scientists became spies. During the 1960s, the United States Navy literally "wired" the oceans in their search for Soviet submarines. Now, safe from the threats of the Cold War, the U.S. has allowed scientists to use these underwater microphones to uncover far different secrets. In the early 90s, marine scientists started spying on whales. Now, these "acoustical oceanographers" hope to study whale communication and behavior by listening to their deep-sea songs. This has proven a difficult endeavor, requiring not only a new perspective of study -- on a "whale's scale" -- but also techniques to filter-out an ever increasing "smog" of human noise. The Navy's Sound Surveillance System (SOSUS) provides the tools to listen. 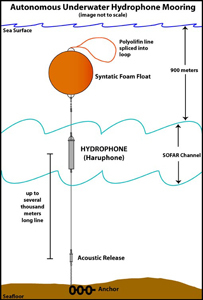 This system connects a series of underwater microphones, called hydrophones, placed in arrays for optimal recording. These permanently submerged hydrophones connect via cables to onshore listening stations accessible by researchers. But, as David Mellinger, Assistant Professor at Oregon State's Cooperative Institute for Marine Resources Studies notes, not just anyone can listen in. The "Pavarotti of the whale world." "Our lab initially gained access in the early 1990's, when the military was focusing on dual use' of Cold War assets, including SOSUS," remembers Mellinger. "The data are classified, so individual members of the lab must still get a security clearance." Matthew Fowler, Mellinger's research assistant, understands the operation of these hydrophones first-hand. He works primarily with autonomous hydrophones, called "sonobuoys," developed at his lab. Researchers deploy the buoys, in places beyond the reach of the military-designed SOSUS system. Sonobouys do not transmit data to onshore listening stations, and instead, record sounds in a hard drive for later retrieval. Researchers replace an autonomous hydrophone array after testing. But what most interests acoustic oceanographers is not the developing technologies to record, but the recordings themselves. In a 1998 National Public Radio interview, Christopher Clark, Director of the Bioacoustics Research Program at Cornell University, described his research as peering through a "telescope into the ocean." Though humans use visual clues (such as stars) for navigation and communication, whales must rely on acoustics for survival in their dark world. Clark's research has shown that whales act much like the submarines originally targeted by the SOSUS; they use natural sonar (in song-form) to locate and follow deep-sea structures. "Whales will aim directly at a seamount that is 300 miles away, then once they reach it, change course and head to a new feature." Clark notes that the whales follow these features  much like humans follow road signs. "It is as if they are slaloming from one geographic feature to the next. They must have acoustic memories analogous to our visual memories." A spectrogram (like those studied by Mellinger and his team) of a northeast blue whale call. Sound, which is nothing more than pressure waves, travels differently in water than air, and Clark recognizes that a change in habitat means a change in communication. For deep dwelling giants, such as the blue whale, calls are slow and low -- below the human threshold of hearing. The blue whale may take up to two minutes to sing one note of his song. To understand and interpret such songs, researchers must analyze the data provided by their underwater microphones. Mellinger describes this process of analyzing "scrolling spectrograms": plots of the various frequencies present in each sound recorded. "We scan the plots by eye," says Mellinger. "Looking for things of interest: earthquakes and other seismic events, and sounds of low-frequency whale species -- namely, blue, fin, minke, and humpback whales. We note when these things happen, and then compile the data to show distributions of these species over time." Sped-up ten to twenty times its original tempo, such songs can sound something like the coo of an owl. The song itself may vary depending on the whale and the occasion for singing. Though the blue whale's call may sound like the simple song of a night owl, Clark describes humpbacks as the "Pavarotti's of the whale world," singing long and complex melodies. Yet many researchers worry that these may be the final performances of such marine operettas. An independent "sonobuoy" developed by the National Oceanic and Atmospheric Administration. "The ocean area over which a whale can communicate and listen today has shriveled down to a small fraction of what it was less than a century ago," states Clark. The cause of this "shriveling" is human noise pollution. Because low frequency sound propagates well under water, sound "byproducts" from shipping, oil drilling, and sonar use may have severe consequences on the whales' acoustical world  consequences on vital activities ranging from migration to reproduction. Mellinger notes, even the study itself has grown increasingly difficult because of this excess sound. "Noise can certainly be a problem," says Mellinger, "not so much because it's hard to tell from whale calls -- but more because it drowns out the sounds we're interested in." Because of this increasing noise, research into whale communication proves not only useful, but urgent. As human pollution destroys researchers' window into the dark world of the whale, the slowly appearing mysteries of the ocean's depths may, once again, become top secret. Bioacoustics research program, Cornell Lab of Ornithology. An Overview of Research on Whale Communication at BRP. Brand, David. "Christopher Clark: Whales off Newfoundland can hear whales near Bermuda." 24 Feb. 2005. Clark, Christopher. Interview with David Baron. Science Friday. Natl. Public Radio. 26 June 1998. Cornell University. "Secrets of whales' long-distance songs are being unveiled by U.S. Navy'sundersea microphones -- but sound pollution threatens." 19 February 2005. Mellinger DK. (2004) Seasonal Occurrence of Sperm Whales Sounds in the Gulf of Alaska 1999-2001. Marine Mammal Science 20(1):48-62. Stafford KM. (1999). Low frequency whale sounds recorded on hydrophones moored in the eastern tropical Pacific. J Acoust Soc Am. 106(6).